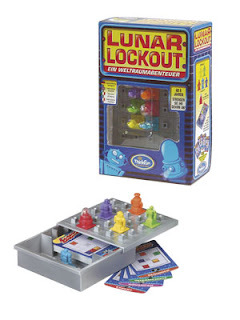 Lunar Lockout is a fun and simple puzzle game, that can be played at home as well as on journeys. The game reminds me a little bit of computer games in general, as Lunar Lockout comes in 40 different levels. The setting of each level is shown on a small card (one card per level) and after putting the different small robots at their respective start point you can start to move them around. If you decide to move one roboter it floats until colliding with another unit. Your goal is to choose the roboters and directions in that way, that your red piece finally reaches the red mark in the middle of the board. 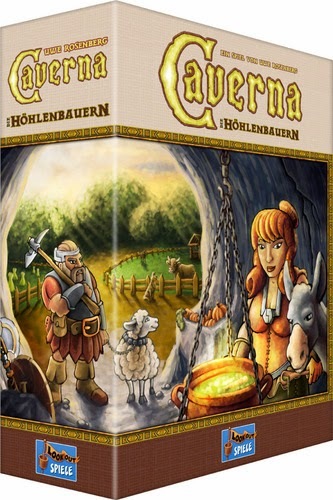 Great little puzzle game for in between, and it's somehow addictive as after solving a level most of the time you want to face an additional challenge!